I recently took a sculpture class at Ringling College, the gift of a good friend. 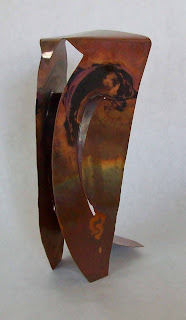 While the focus in the class was on planar sculpture (this image is one of my projects, done in copper), I learned a great deal about three-dimensional work, which I am looking forward to applying to mosaic. For one thing, the instructor, Joni Younkins-Herzog, emphasized looking at a piece to be sure that it was interesting from all sides. Since I've been working mostly in two dimensions on flat surfaces with mosaic heretofore, this basic tenet had not penetrated my brain. Well, duh! I also learned about considering negative space, and how to move away from my predominantly realistic approach to see an image in more abstract, suggestive terms. I was hoping for this transition; I had been feeling for quite a while that I was sort of "stuck" in the realism mode. Now I am re-examining all of the 3-D pieces I've done previously -- as well as my ideas for future projects -- to see how they can be improved using the techniques and theories I've learned in the class. It was great to be in class again -- like a brain refreshment, which I'm sure will improve any art I do in the future. My dear sister Barbara Porter died last week. Besides being a good friend, as everyone who reads this blog knows, she has been a source for many unusual garage sale finds that I use in my mosaics. She will live on in her three beautiful children, her sweet new granddaughter age 6 1/2 months, and in all of her many contributions to art and life. I will miss her.